Radio Ceylon (Sinhala: ලංකා ගුවන් විදුලි සේවය Lanka Guwan Viduli Sevaya, Tamil: இலங்கை வானொலி, ilankai vanoli) is the oldest radio station in Asia. Broadcasting was started on an experimental basis in Ceylon by the Telegraph Department in 1923, just three years after the inauguration of broadcasting in Europe. The history of Radio Ceylon dates back to year 1925, when its first precursor, Colombo Radio, was launched on 16 December 1925 using a Medium Wave radio transmitter of one kilowatt of output power from Welikada, Colombo. Commenced just 3 years after the launch of BBC, Colombo radio was the first ever radio station in Asia and the second oldest radio station in the world. Home of Ceylon Gramophones. This new medium of mass communication not only became increasingly popular in the years that followed, but also quickly evolved into a medium of national character, which led to the “Radio Service” being organized as a separate department of the government of Ceylon (as the country now Sri Lanka was then called) by the ‘call sign’ ‘Radio Ceylon’ in 1949. Subsequently, in 1967, the Department of Broadcasting was transformed into its present statutory form of a state corporation by the Ceylon broadcasting corporation Act. No 37 of 1966 of the parliament of Ceylon, thereby assuring increased autonomy and flexibility in the operations of the new organization. The organization acquired its present name, Sri Lanka Broadcasting Corporation, with the transition of the state into the status of Republic of Sri Lanka on 22 May 1972. SLBC ( Stand for Sri Lanka Broadcasting Corporation) has since continued in the same legal status as a state corporation, and is currently listed under the scope of the ministry of Information and Media of the Government of Sri Lanka. This was followed by the ‘Island FM Development Project’ that was launched in year 1995. The objectives of the project were to develop an Islandwide multi-channel FM stereo broadcast transmission network and to divest the costly domestic medium wave transmitting stations, which were typically broadcasting only one or two programme channels per transmitting station. By 1999, more than 95% country’s total population was being covered by SLBC’s FM transmissions with nearly 90% of them receiving all six nationwide channels. While the first 03 channels are dedicated for public service broadcasting in the three languages Sinhala, Tamil and English, the fourth one (City FM) is maintained as a channel dedicated for the youth. The last two channels, whilst representing ‘an adult contemporary’ genre, accommodates a certain amount of commercial content. Besides the above six channels operated on a regular basis, SLBC also operates on nationwide basis a seventh channel, namely the ‘Sports Service’, which is a channel dedicated for sports, but only during the times of major sports events such as international cricket matches. The other component of domestic broadcasting comprises 04 Regional Services, each of which are originating from respective regional studio centres, and 05 community radio services, operated in five specific areas with substantial socio economic homogeneity. All of these regional and community radio services maintained by the SLBC largely represent a public service broadcasting format with regional community focus. In addition to the above domestic services, SLBC is also operating a host of overseas services, transmitting in short-wave to the South & South-West Asia and the Middle East, in Sinhala, English, Hindi and several Indian sub-continental languages. Also, there is a medium wave transmitting facility for broadcasting mainly to the Southern regions of India. Edward Harper, who came to Ceylon as Chief Engineer of the Telegraph Office in 1921, was the first person to actively promote broadcasting in Ceylon. In the first-ever radio experiments in Colombo, gramophone music was broadcast from a tiny room in the Central Telegraph Office with the aid of a small transmitter built by the Telegraph Department engineers from the radio equipment of a captured German submarine. The experiment was a success and three years later, on 16 December 1925, a regular broadcasting service came to be instituted in Ceylon. The station was called "Colombo Radio," with the call sign "Colombo Calling." Harper also founded the Ceylon Wireless Club together with British and Ceylon's radio enthusiasts in the city of Colombo. Ceylonese engineers joined the Ceylon Wireless Club and carried out radio experiments with Edward Harper. These were exciting times for radio in South Asia. Many[who?] regard Edward Harper as the "Father of Broadcasting in Ceylon." During World War II, the radio station operations were taken over by the allied forces who operated Radio SEAC from Colombo. The station was handed over to the Government of Ceylon after the war. Radio Ceylon came into being after the war and climbed broadcasting heights in South Asia, leading the way in the world of entertainment and news. The very first senior management officers of the station came from the BBC; John Lampson was appointed Director General of broadcasting, and Pascoe Thornton was appointed Director of Programmes of the National Service at the station. Civil servant M.J Perera was the first Ceylonese Director-General of Radio Ceylon and another civil servant, Vernon Abeysekera, was appointed Director of Programmes. Radio Ceylon has produced some of the finest announcers of South Asia among them: Livy Wijemanne, Vernon Corea, Pearl Ondaatje, Tim Horshington, K S Raja, Greg Roskowski, Jimmy Bharucha, Mil Sansoni, Eardley Peiris, Shirley Perera, Bob Harvie, B.H.Abdul Hameed, Claude Selveratnam, Christopher Greet, Prosper Fernando, Tony de Costa, the Ganjwar sisters; Vimla and Kamini ( The first Hindi announcers on the commercial service), Ameen Sayani (of Binaca Geetmala fame), S.P.Mylvaganam (the first Tamil Announcer on the Commercial Service), Thevis Guruge, H.M.Gunasekera, A.W.Dharmapala, Karunaratne Abeysekera, Chitrananda Abeysekera, Kailayar Sellanainar Sivakumaran, Mervyn Jayasuriya, Vijaya Corea, Elmo Fernando, Eric Fernando, Nihal Bhareti Leon Belleth and V Sundharalingam. Pioneering broadcaster, Vernon Corea (left) with fellow announcers in a studio at Radio Ceylon, Colombo in 1958. Other Sri Lankan personalities such as Owen de Abrew, the most senior Ballroom Dance professional on the island and top film director Lester James Peiris ( who reviewed books for ' Radio Bookshelf ' ) were involved in radio programmes on the airwaves. This was in the heyday of Radio Ceylon, the announcers and presenters, particularly those who presented radio programmes on the All Asia beam, enjoyed iconic status. Radio Ceylon ruled the airwaves in South Asia as millions in the Indian sub-continent tuned into the radio station. People picked up Radio Ceylon broadcasts as far away as the United States of America. The Hindu newspaper placed Ameen Sayani and Vernon Corea of Radio Ceylon in the top five great broadcasters of the world. Radio Ceylon turned young Ceylon's talent into household names - among them the Ceylon's musicians of the 1950s and 1960s - Nimal Mendis, Bill Forbes, Cliff Foenander, Des Kelly, Adrian Ferdinands, Tissa Seneviratne, Harold Seneviratne, Douglas Meerwald and the Manhattans, to name a few presented by Ameen Sayani on the Overseas Service among them. There was also a religious and cultural dimension to radio programming and Radio Ceylon broadcast Buddhist, Hindu, Muslim and Christian programmes. The station had ' three broadcasting arms ' - the Commercial Service, the National Service and the All Asia Service. Radio programmes were broadcast in English, Sinhala and Tamil - the All Asia beam had many programmes broadcast in Hindi. Pandit W. D. Amaradeva and other distinguished Sri Lankan musicians have all given concert recitals in the studios of the station. Radio Ceylon had a very lucrative arm - the Hindi Service of the station launched in the early 1950s. Millions of rupees in terms of advertising revenue came from India. The station employed some of the most popular Indian announcers who played a vital role in establishing Radio Ceylon as the 'King of the Airwaves' in South Asia, among them, the Ganjwar sisters, Vimla and Kamini, Vijay Kishore Dubey, Gopal Sharma, Hasan Razvi , Vijaylaxmi Ripusudan Kumar Ailawadi, popularly known as Kumar and Manohar Mahajan, Sunil Dutt (who went on to become a film star in Bollywood), Ameen Sayani and elder brother Hamid Sayani though not hired by Radio Ceylon became popular by using Radio Ceylon for broadcasting programs like "Binaca Geetmala" (first broadcast in 1952) and "Lipton Ke Sitaare." What captured the Indian listener were the film songs, the golden age of Hindi film music was in the 1950s and 1960s - Radio Ceylon was at the right place at the right time to reach out to the target market of millions of listeners - the station popularised the movie songs, including the talents of playback singers Asha Bhosle, Lata Mangeshkar, K.L. 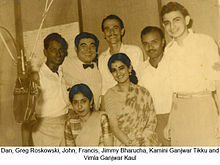 Saigal, Kishore Kumar, Mukesh, Mohammed Rafi, S. Janaki and others. This was a brilliant move by Radio Ceylon as Bollywood film music was banned by All India Radio and other Indian radio stations at the time. This led to increased listenership for radio programmes such as Binaca Geetmala. Radio Ceylon had a captive audience. The Binaca Hit Parade was presented by 'happy go lucky' Greg Roskowski, it was a countdown of English pop music beamed on the Commercial Service and the All Asia Service. Having heard the programme, Indian listeners flooded the station with letters requesting a count down of Hindi filmi songs and the idea of Binaca Geetmala was born. Radio Ceylon also popularised the English songs of Indian popular musicians - they went on to score huge hits, among them Uma Pocha( Bombay Meri Hai ), Usha Uthup who has the rare distinction of singing Sri Lankan baila songs with ease and the Anglo-Indian star, Ernest Ignatius ( who went on to be a success in Sir Andrew Lloyd Webber's 'Bombay Dreams' in London ) had a massive hit, I Married a Female Wrestler, on Radio Ceylon. The station was an advertiser's dream - thousands of jingles were recorded and beamed on the All Asia Service - from Lux soap to Coca-Cola. Major brands queued up for their jingles to be broadcast live by the announcers over the airwaves of Radio Ceylon, such was the station's advertising power. 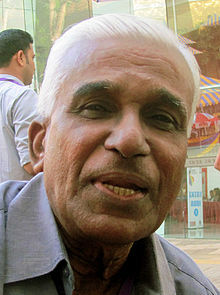 Masterminding the revenue from India was Radio Ceylon's advertising agent, Hari Haran, from Radio Advertising Services. Clifford R. Dodd, Director of the Commercial Service of Radio Ceylon, who came to the island under the Colombo Plan pictured here in 1958. Australian Clifford Dodd was sent to Radio Ceylon under the Colombo Plan. Dodd turned the Commercial Service of Radio Ceylon into a huge success. Dodd was a charismatic figure and he used his powers of persuasion to rise above politics to make Radio Ceylon into a successful brand name in South Asia. The radio station had no real competition in the region. Clifford Dodd and Livy Wijemanne hand picked some of the brightest talents in Sri Lanka, turning them into popular professional broadcasters. Clifford R. Dodd's leadership, enthusiasm and drive helped motivate the young Ceylonese broadcasters - they were the brightest and the best in terms of creative talent. Dodd helped shape the Commercial Service of Radio Ceylon. The station spiralled upwards in terms of popularity and revenue for the country. Director General Neville Jayaweera in the boardroom of Radio Ceylon. Radio Ceylon became a public corporation on 30 September 1967 and the station's name was changed to the Ceylon Broadcasting Corporation. Prime Minister Dudley Senanayake appointed a distinguished Ceylonese civil servant, Neville Jayaweera to head the CBC. When Sri Lanka became a republic in 1972 the station underwent yet another name change as the Sri Lanka Broadcasting Corporation (SLBC). In December 2005 Sri Lanka celebrated eighty years in broadcasting, a historic landmark in the world of broadcasting. On January 5, 2007 the Sri Lanka Broadcasting Corporation celebrated forty years as a public broadcasting corporation. ^ "Papers of Adrian Jose (1908-1991)". ^ "When Ceylon ruled the airwaves". ^ Mixed Signals Radio Broadcasting Policy in India (page: 2176) (PDF). ^ "Sri Lanka Consolidated Acts". ^ "Welcome to the Ministry of Mass Media and Information". ^ "Sri Lanka Media Stats". ^ "SLBC - Sinhala National Service (Swadeshiya Sevaya) Online Live Radio". ^ "SLBC Tamil National Service". Archived from the original on 29 March 2015. ^ "English Service". Archived from the original on 15 September 2014. ^ "City FM". Archived from the original on 20 December 2014. ^ "For that Old Magic (Frontline Magazine, India)". Archived from the original on 18 September 2008. Retrieved 4 September 2008. ^ "Radio SEAC Ceylon (Radio Heritage Foundation)". Retrieved 2008-09-04. ^ "Gnanam Rathinam - a pioneer Radio Ceylon broadcaster". Retrieved 2008-09-04. ^ "Opinion: Fond Memories (Hindu Newspaper, India)". The Hindu. Chennai, India. 2005-12-21. Retrieved 2008-09-04. ^ "Owen de Abrew:Dance teacher par excellence (Sunday Times, Sri Lanka)". Retrieved 2008-09-04. ^ "Lester James Peries, a figure of the nation's destiny (Sunday Island, Sri Lanka)". Retrieved 2008-09-04. ^ "When Ceylon ruled the airwaves". Retrieved 2008-09-04. ^ "QSL card from Radio Ceylon for report on 30 April 1954 (The Classic Shortwave Broadcast QSL Page)". Retrieved 2008-09-04. ^ "Vernon Corea's Death Anniversary (Daily News, Colombo)". Archived from the original on 4 June 2011. Retrieved 4 September 2008. ^ "Those Golden Voices (Hindu Newspaper, India)". Retrieved 2008-09-04. ^ "Nimal Mendis composes tsunami song (Daily News, Sri Lanka)". Archived from the original on 19 January 2008. Retrieved 4 September 2008. ^ "Stories from Ole Ceylon: Bill Forbes". Retrieved 2008-09-04. ^ "The Big Band Musician". Retrieved 2008-09-04. ^ "A legendary affair with the airwaves (Hindu Magazine,India)". The Hindu. Chennai, India. 2006-08-13. Retrieved 2008-09-04. ^ Roy, Sandip (21 September 2005). "ASIAN POP:The life and times of Asha Bhosle, enchanting songstress of Bollywood, now appearing with Kronos Quartet (San Francisco Chronicle, USA)". The San Francisco Chronicle. Retrieved 2008-09-04. ^ "That mesmeric voice (Metro Plus, Chennai-The Hindu, India)". Archived from the original on 22 March 2010. Retrieved 4 September 2008. ^ "Reference to Greg Roskowski and the Binaca Hit Parade on Radio Ceylon on 'Who moved my Aiwaves?' (businessgyan.com)". Archived from the original on 26 October 2007. Retrieved 11 September 2008. ^ "Reference to Ernest Ignatius and his hit 'I married a female wrestler'". Archived from the original on 6 August 2008. Retrieved 2008-09-12. ^ "It's All in the Name(The Hindu, India)". Retrieved 2008-09-04. ^ "Eighty Years in Broadcasting in Sri Lanka (Daily News, Colombo)". Archived from the original on 25 September 2008. Retrieved 4 September 2008. Wavell, Stuart. - The Art of Radio - Training Manual written by the Director Training of the CBC. - Ceylon Broadcasting Corporation, 1969. Ceylon, Radio. - Standards of Broadcasting Practice - Commercial Broadcasting Division. - Radio Ceylon, 1950. This page was last edited on 27 December 2018, at 21:50 (UTC).